Fat Hippo hardly needs an introduction if you live in the North East, they've been serving the very best burgers in Newcastle for a fair few years now. 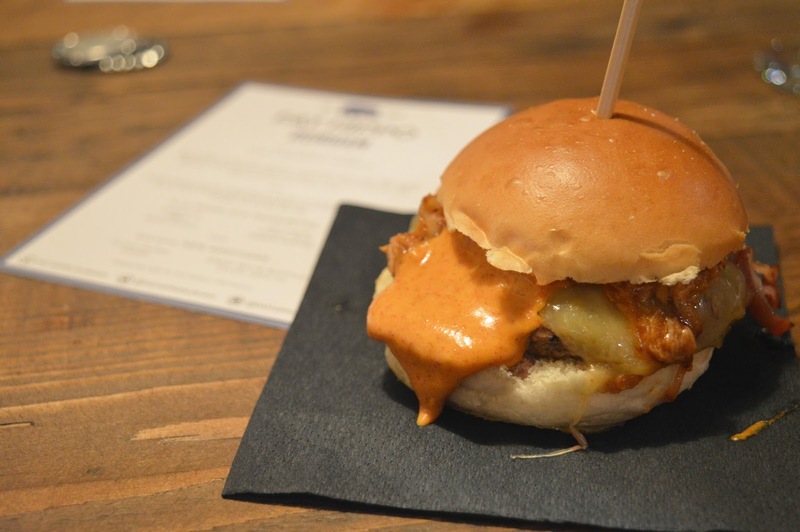 Following the huge success of their original restaurant in Jesmond, Fat Hippo Underground arrived in Newcastle's city centre a couple of years ago, introducing their burgers to city workers and hungry shoppers, winning a whole legion of new fans. If you're new to the Fat Hippo Appreciation Society, welcome and where have you been? Did you not know that Fat Hippo are a right of passage in the North East? Serving the juiciest pink burgers in squishy buns fully loaded with cheeky amounts of toppings, you haven't lived until you've found yourself staggering out of the Hippo with sauce down your chin and tummy bursting out of your jeans. It really was only a matter of time before Fat Hippo started taking on the rest of the North East (hopefully before conquering the world!) 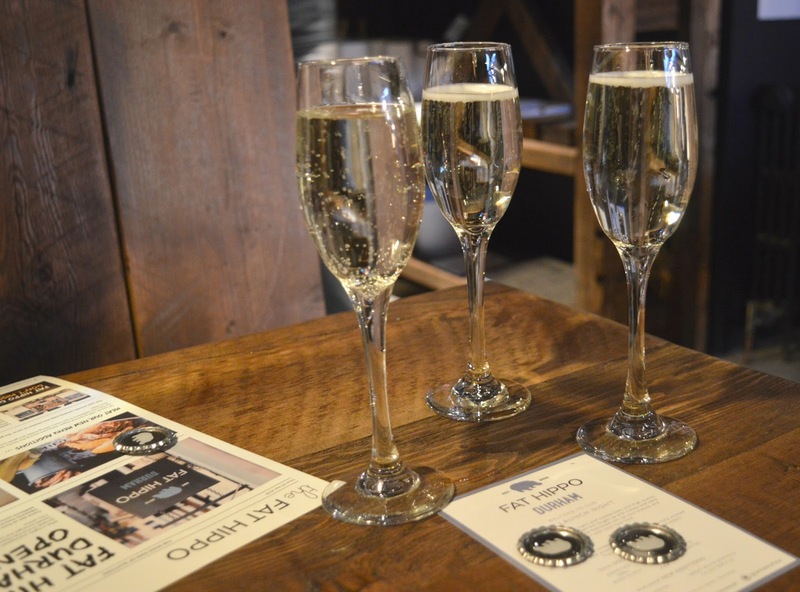 and last week their highly anticipated third restaurant opened in the historic city of Durham. 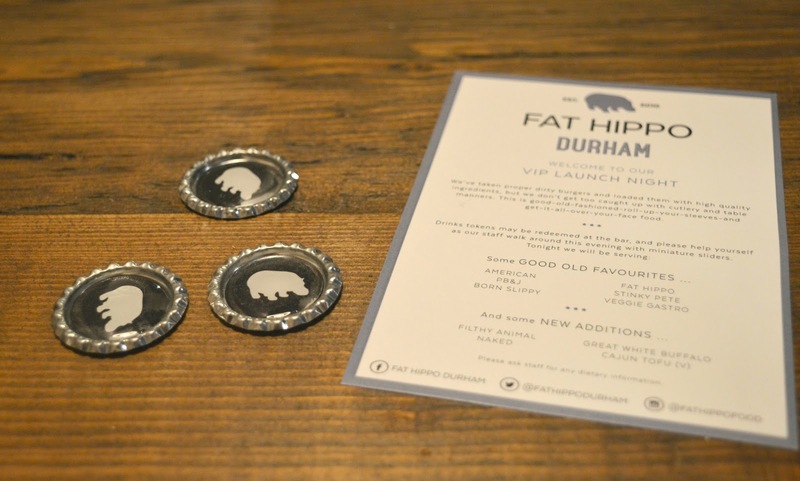 I was very lucky to be invited to the VIP Launch night where I made a solemn promise to myself to eat as many burgers as I could possibly manage to bring you all of the gossip on what you can expect from Fat Hippo Durham. Fat Hippo have got themselves a beautiful new home in the centre of Durham. 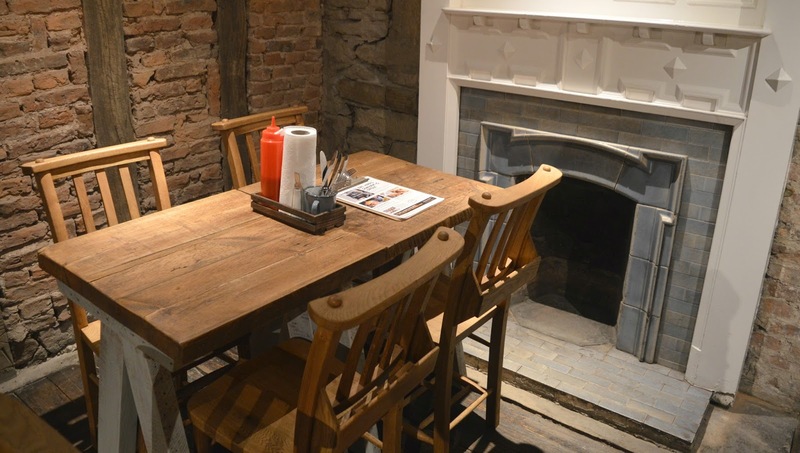 A Grade II listed building, comfortably nestled on the cobbles of Saddler Street it has a prime location. 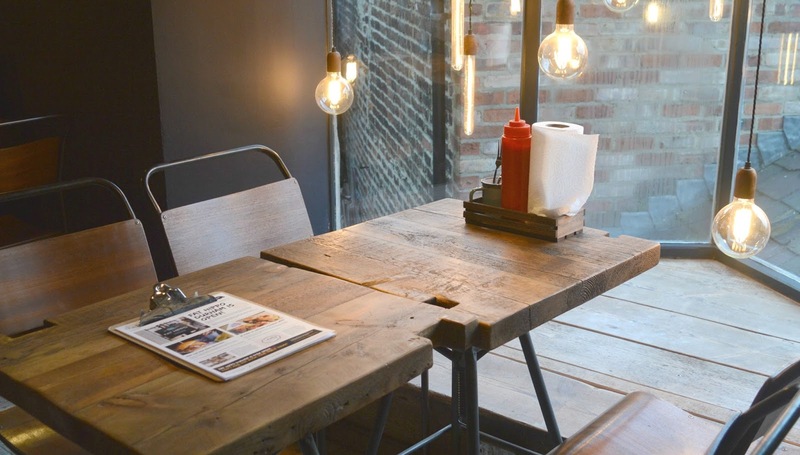 Exposed lights and brick, tiled floors and funky wooden seats welcome you in and the two floors means plenty of tables for hungry burger fans. Hippo's new home ticks a lot of boxes! 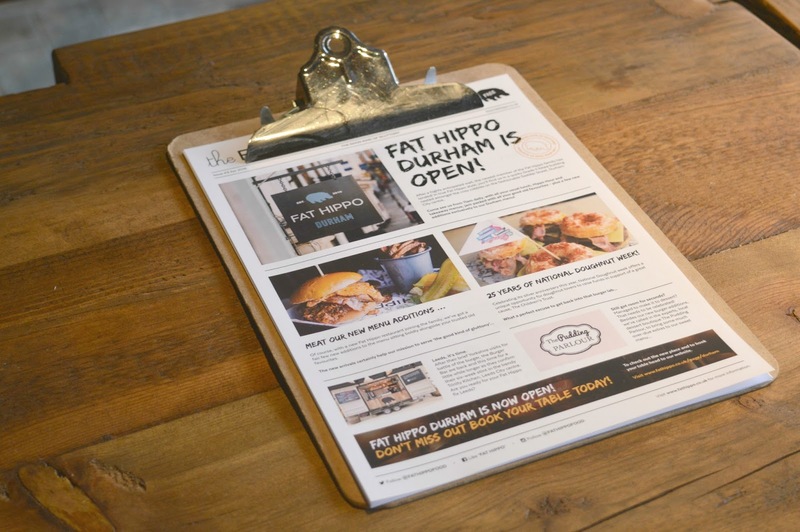 Long time fans of Fat Hippo will be pleased to hear that all of the old favourites are on the menu so you'll be able to order your usual from the Durham branch. For me that's usually the American (Double 4oz patty topped with cheese, gherkins, ketchup and American mustard), a simple burger with no fuss served the very best way. Now, you may be thinking from the size of the burgers in these pictures, mmm the burgers at Fat Hippo Durham are a little small. Well, don't you worry, we were just trying out miniature versions, believe me the proper burgers are the real deal. In fact the Hippo burgers are so huge I usually struggle to finish mine. As a long time stalker of Fat Hippo on Twitter I often see people raving about the PB&J (double 4oz patty completely smothered in a generous dollop of chunky peanut butter) and the Stinky Pete (double 4 oz topped with blue cheese) and I'm sure the residents of Durham are going to become huge fans in no time. Of course, with an exciting new launch like this comes a few sneaky new additions to the menu and there are four new burgers that have been created especially for Durham. I managed to get my hands on the brand new Filthy Animal (double 4oz patty topped with cheese, pork rib meat, streaky bacon and Filthy sauce). Wow! This new Hippo Burger is an absolute beast, so delicious! You really must order it when you visit. One little tip for you if you're going to become part of the Fat Hippo family - you don't need to worry about table manners. You'll find kitchen roll on every table and that's because things are going to get messy. Forget the cutlery, Fat Hippo Burgers are best eaten by hand with sauce dripping down your fingers. It's not just about the burgers and if, like me, you have a sweet tooth Fat Hippo Durham have teamed up with one of my favourite makers of sweet treats, The Pudding Parlour. I will admit that so far, I've never been able to make it to dessert at Fat Hippo but whenever I visit the Durham restaurant I'll definitely be making an effort to get there. You'll find Cookie Dough Pie, Waffles and Toblerone Cheesecake amongst the goodies on Durham's dessert menu. There's also some rather fantastic news if you're from Leeds as Fat Hippo are also arriving in Trinity Kitchen. From 16 May, for 6 weeks you'll be able to get the very best burgers in the North East in Yorkshire! So there's plenty to celebrate for fans of the Hippo! For a long while now we've all known that the best burgers in Newcastle are to be found at Fat Hippo and I think it's safe to say that the best burgers in Durham have arrived. What's your favourite burger at the Hippo? I need to know what to try next! *Raises hand* sadly.. I'm not part of the FHA.. however, I would love to be! And definitely need to source this place wen we take a day trip to Durham soon! Oh my word, now I've got burger cravings, they look so good! I ended up on a night out in in the South of France with one of the co-owners of Fat Hippo last week (small world) and I was telling him to keep an eye out for a post on your lovely blog, hope he sees it!